Not all B2B prospects are the same. An online retailer has different technology needs than a bank. They simply care about different things. While the latter has share of wallet and compliance top of mind, the retailer lies awake about conversion and logistics. As a result, these different goals and business models lead to different characteristics for a B2B prospect, with different pains, and different budgets to fix those pains. Most SaaS sales teams recognise this need for tailored sales strategies and tactics in their territory plans. That is, to some extend; a key aspect typically doesn’t get the attention it deserves, setting the sales team up for failure. Let’s start with what your territory plan most likely already covers – positioning. If you sell a SaaS solution that roughly does the same for all customers, it doesn’t mean your sales pitch should be positioned in the same way to all your prospects. Your pitch should be tailored, so that potential buyers can recognise their own pains and objectives – and easily see how your solution can help with that. Your sales training would have focused on customising talk tracks and sales pitches to client-specific themes. Maybe you even have a sales enablement team that created vertical-specific playbooks, to help position the value of your solution through tailored sales messaging. Awesome – the more your pitch is positioned in line with the prospect’s view of the world, the better. There is another aspect of the notion that not all prospects are the same, and it typically doesn’t get the attention it deserves in sales plans. Segmentation. In fact, the concept of segmentation sometimes gets mixed up with positioning. They are two different things. Positioning determines what you will pitch, while segmentation determines who you will pitch that message to, or in B2B sales: what kind of companies you will go after. The aim of segmentation is to identify high yield segments – that is, a group of accounts that are likely to have the highest chances of buying from you, or that have the highest growth potential for land-and-expand deals. The whole idea is that you should target those accounts before you go after other segments that are less likely to buy from you. Yet, many B2B SaaS sales teams don’t put a lot of thought into what such companies tend to look like. What is often in place in terms of segmentation is pretty rudimentary. Most B2B Sales teams merely look at “vertical” or “size” as key characteristics for segmentation, and blindly take guidance on that from headquarters. For example, they’ve prioritised “Retail” or “Financial Services” over “Manufacturing” or “Government”. Or they decide to only go after “enterprise accounts”, or organisations between 10 and 1,000 employees. But these segments are often way too broad: thousands of accounts end up in a territory with the presumed notion they’ll all have the same propensity to buy. This absence of a smart segmentation strategy in sales nearly always leads to a lack of focus – with frustrating results. There’s nothing worse than filling up the top of the sales funnel with the wrong kind of opportunities. It creates a false sense of hope, which will take a while to get exposed, because reps often find it difficult to let go of an opportunity once it’s past qualification. They end up wasting time and resources as they repeatedly push the opportunity into the next quarter. To see how big a problem that is for you, run some pipeline reports on “Pushed out more than 3 times”, “Lost to No Decision”, or “Lost to a competitor that we don’t really think is a competitor”. If that raises some alarm bells, you need a more thoughtful segmentation approach that goes deeper on this notion of propensity to buy. Segment your territories on propensity to buy by implementing the ABC Model. “A” accounts are those who are most likely to buy, “B” are less likely and “C” are the ones you want to avoid (even if they joined five of your webinars). Develop a parlance where Marketing, SDRs, Sales Reps and Sales Management show an understanding that the companies they go after should fit in either the A bucket, maybe the B bucket, but definitely not the C bucket. This ABC distinction should be done on three areas of characteristics: Firmographics, Technographics and Demographics. Your current segmentation most likely already covers some of the Firmographics. These are the things you can easily determine from the outside: the number of employees at the prospect, its vertical, revenue, business model, and geographical reach. But as said, you need to go deeper. In SaaS, the Technographics often say much more about likelihood to buy; it reflects the current technology footprint of an account. Buying SaaS needs a level of maturity, which often is revealed by other technology solutions the prospect uses. At its simplest, Prospect A who uses your cheaper competitor is more likely to be ready to “upgrade” to yours, than Prospect B who has never even bought SaaS and still uses manual processes and spreadsheets. Even if Prospect B is of the right size and in the right vertical! 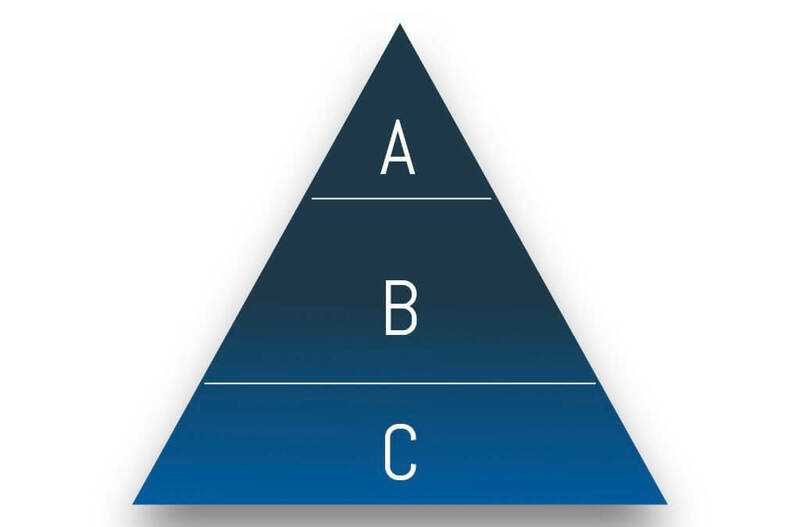 Determine what these Technographics look like for your A, B and C accounts. Then, use tools like Ghostery, Builtwith, or Datanyze to see what technologies are in place at accounts in your territory; get the enterprise edition so you can integrate it with your CRM. As for Demographics, you look at the people side to determine the propensity to buy. Companies tend to develop (or hire for) specific skillsets first, before they buy the technology. Not the other way around. Look for key skills and role titles that are telltale signs for a readiness for your solution. At its simplest, who is more likely to buy from you? Person A who used your tool before and just started a new role in a different company that’s growing rapidly, or Person B who’s been in the role for ten years with a company that’s hardly investing in new technologies? Again, decide what these skills and roles look like for your A, B, and C accounts. Then, see what’s out there. Tools like Zoominfo and Discoverorg offer some value, but don’t always have good data for companies and contacts in APAC. Linkedin is your biggest friend here, particularly the jobs section, where you can create alerts that let you know when certain roles pop up. Go after companies that are hiring for those skills as they will likely be in the market for a technology solution soon. I know that this sounds like a lot of work, but remember, if you fail to plan, you plan to fail. Some of the tools mentioned will make this effort easier, and predictive analytics solutions like Leadspace, Mintogo, Insideview, and 6sense can even automate much of it. However, they don’t always have quality data sets for APAC. And since propensity to buy characteristics in APAC are not necessarily the same as those in the US or EMEA, be careful on relying too much on such technologies. For now, spend some time doing it yourself for your territory. The effort of thinking through this ABC segmentation will create more focus in sales. It is not meant to be an algorithm that’s 100% correct, but it still will provide a more granular appreciation around what makes a prospect more likely to buy from you. Have a workshop with marketing, the SDRs, the CSMs and the AEs to determine what makes an A account, and what makes a B or a C. That exercise in itself is going to create several aha! moments that will lead to more focus in your marketing and sales activities.